News and information about the contentious 2016 presidential election is permeating the American public, according to a new survey of 3,760 U.S. adults by Pew Research Center. About nine-in-ten U.S. adults (91%) learned about the election in the past week from at least one of 11 types of sources asked about, ranging from television to digital to radio to print. This is true even among younger Americans, as 83% of 18- to 29-year-olds report learning about the presidential election from at least one stream of information, according to the survey conducted Jan. 12-27, 2016, using Pew Research Center’s American Trends Panel. Americans are divided, though, in the type of sources they find most helpful for that news and information. When asked if they got news and information about the election from 11 different source types, and then asked which they found most helpful, Americans were split: None of the source types asked about in the survey was deemed most helpful by more than a quarter of U.S. adults. At the top of the list is cable news, named as most helpful by 24% of those who learned about the election in the past week. That is at least 10 percentage points higher than any other source type. Our past research indicates though, that the 24% is likely divided ideologically in the specific network they watch and trust. 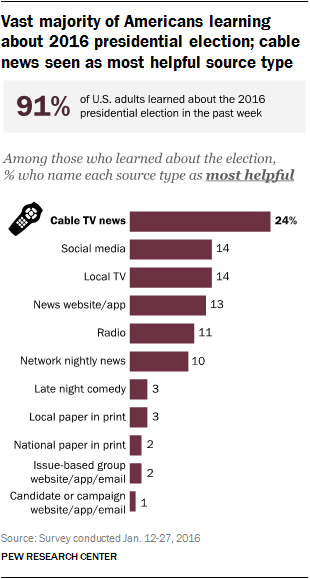 After cable, five source types are named as most helpful by between 10% and 14% of those who got news about the election: Local TV and social networking sites, each at 14%, news websites and apps at 13%, news radio at 11% and national nightly network television news at 10%. In the bottom tier are five source types named by no more than 3% of Americans who learned about the election. This includes print versions of both local and national newspapers, named by 3% and 2% respectively. It also includes late night comedy shows (3%) as well as the websites, apps or emails of the candidates or campaigns (1%) and of issue-based groups (2%). As a platform, television and the Web – and even radio to a lesser degree – strongly appeal to certain parts of the public, while print sits squarely at the bottom. As many people name late night comedy shows as most helpful as do a print newspaper. Age, education level and political party account for some of the differences here. Cable television’s overall popularity is pronounced among those who are 65 and older and also among Republicans, while social media is the clear favorite among the youngest age group, 18- to 29-year-olds. About four-in-ten (43%) of those 65 or older who learned about the election in the past week say cable television news is most helpful, 26 percentage points higher than any other source type and much higher than any other age cohort. In fact, only 12% of 18- to 29-year-olds who learned about the election say that cable news is the most helpful. 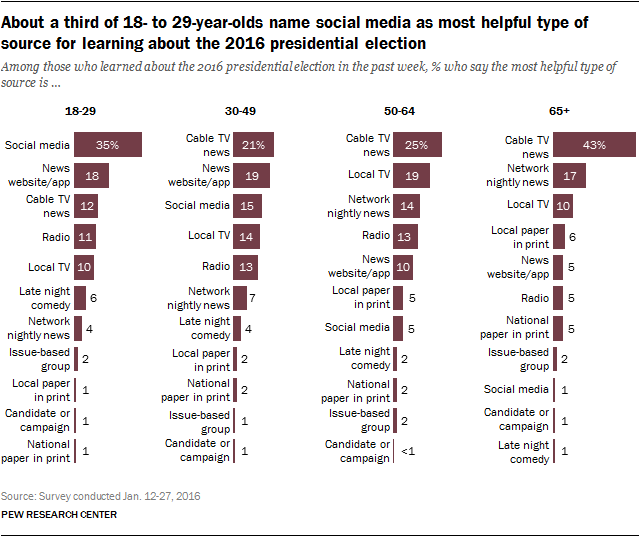 Instead, about a third (35%) of 18- to 29-year-olds name a social networking site as their most helpful source type for learning about the presidential election in the past week. This is about twice that of the next nearest type – news websites and apps (18%), another digital stream of information. Social media drops off sharply for older age groups, with 15% of 30 to 49-year-olds, 5% of 50 to 64-year-olds, and just 1% of those 65 years and older saying the same. This is consistent with our previous research, which has shown that social media is the most prominent way that Millennials get political news, more so than any other generation. The data also reveal the weight network television news and local TV news still carry among those 50 or older. Radio, though, shows consistent appeal across most age groups. Between 11% and 13% of those ages 18-29, 30-49 and 50-64 name radio as most helpful (a figure that falls to 5% among those 65+). The area of difference that stands out most prominently along party lines is cable news. Republicans are almost twice as likely to say cable news is the most helpful than are Democrats (34% vs. 19%, and 24% among independents). Democrats are slightly more likely to name local TV news, but the gap is much smaller (18%, compared with 12% for both Republicans and independents). Finally, those with a college degree are more likely than those with some college and those with a high school diploma or less to name radio, national papers in print, and news websites or apps as the most helpful type of source. Those who do not have a college degree are tied more closely to a preference for cable and local TV news. 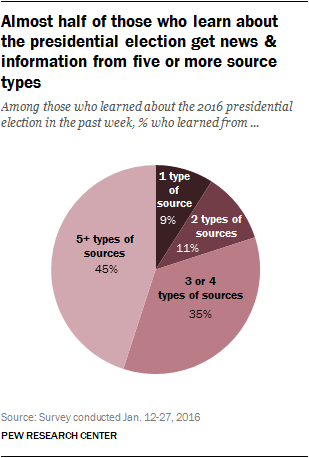 Even as U.S. adults find one type of source most helpful, the majority still get election news in a given week from multiple different source types. Indeed, of those who learned about the presidential election in the past week, just 9% learned from just one stream of information. In fact, almost half (45%) learned from five or more information streams. Television sources again rise to the top. About three-quarters of U.S. adults (78%) learned about the election from at least one of the four TV-based source types asked about. Local TV and cable news reach the greatest percentages overall (57% and 54% respectively). This was followed not by another traditional platform, but instead by digital. About two-thirds (65%) of U.S. adults learned about the 2016 election in the past week from digital source types, which includes social networking sites and news websites, as well as digital communication from issue-based groups and the candidates. Coming in last: print versions of newspapers. Only about one-in-three (36%) U.S. adults learned about the campaign in the past week from either a local or national newspaper in print. The survey specifically asked about the print version of the paper and does not include the representation of newspapers in the digital space (48% of Americans got election news and information from news websites or apps in past week). This is an important distinction, as newspaper properties make up three of the top 10 digital news entities, according to comScore data compiled for our annual State of the News Media report. But it does speak to the precipitous decline of print as a mode of news – even as print-only consumers remain a key part of newspapers’ audiences. In fact, more Americans cite radio as a source of election information in the past week (44%) than cite a print newspaper. And U.S. adults are roughly as likely to learn about the presidential election from an issue-based group’s website, app, or email (23%) or from late night comedy shows (25%) as from a national print newspaper (23%). And they are only slightly more likely to learn from their local print paper (29%). While few Americans say issue-based groups or the campaigns themselves are most helpful, their presence as a direct source of information in the digital space comes through in these findings. At least two-in-ten U.S. adults learn about the presidential election directly from the websites, apps or emails of campaign and issue-based groups. Level of usage differed notably by political party identification for late night comedy shows. They are a source for three-in-ten Democrats, but only 16% of Republicans and a quarter of independents. 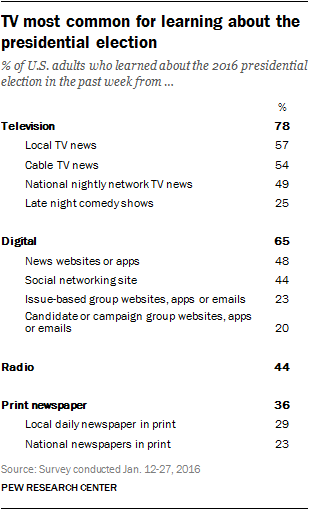 About a third of those ages 18-29 (34%) learned about the campaigns and candidates from late night comedy shows, higher than any other age group. As we have seen in the past, getting news from social media is far more common than sharing news on social media. About half (51%) of social networking users learned about the presidential election from these sites. But only about one-in-five social networking users (18%) actually share election-related information on social media, whether by posting about it or by replying to or commenting on a post. That amounts to 15% of U.S. adults overall. Those who learn from more source types are also more likely to share news and information, as are those for whom social media was most helpful for learning about the election. Almost three-in-ten of social media users who learn from 5 or more source types share something related to the presidential election on social media (29%), compared with no more than 12% of those who learned from fewer source types. And a third of those who name social media as their most helpful source (33%) share news and information about the election on these sites. Comparatively, this is true of only 20% of those who name cable news as their most helpful source type and a mere 8% who name local TV news. Finally, while those with higher incomes are more likely to use social networking sites in general, it is lower income users who are more likely to share election-related content: About 20% of social networking users with household incomes under $75,000, compared with 14% of those with incomes of $75,000 or more. Though it is common to learn about the election on at least one social networking site, Facebook is far and away the site where that is most likely to happen. This is not surprising, given that Facebook is the social networking site used by the most Americans, and is an increasingly common news destination, especially for Millennials. As we have seen before, there is also evidence that getting news from multiple social networking platforms is common: 41% of those who learn about the election on social media get election information from more than one social networking site. There are a number of ways that the election news habits of Americans who are most likely to participate in the upcoming presidential primaries and caucuses stand apart from those who are less likely to participate. Overall, those who say they are very likely to participate in their state’s primary or caucus are more likely to learn about the election from multiple source types. Half of those who said they are very likely to participate learned from five or more source types, compared with 40% of those who are less likely to participate. Within this mix of information streams, there are also differences between the two groups in the source types deemed most helpful. While cable ranks first among both groups, those who are very likely to participate show somewhat greater tendency to name both cable (27% vs. 22%) and radio (12% vs. 9%) as most helpful. 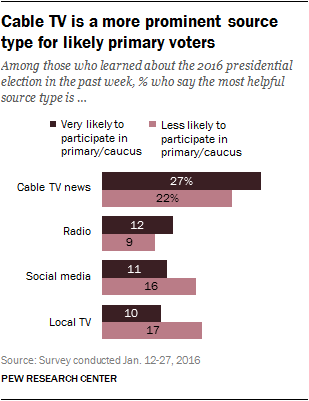 Conversely, they have a lower tendency to name local TV news (10% vs. 17%) and social media (11% vs. 16%) as most helpful than those who are less likely to participate in their state’s primary or caucus. Even though those who say they are very likely to participate in their state’s primary or caucus are less likely to name social media as their most helpful source type, they seem to be more engaged in that space: 21% share information about the election on social media, through original posts or replies to content posted by others, compared with 15% of those less likely to participate.